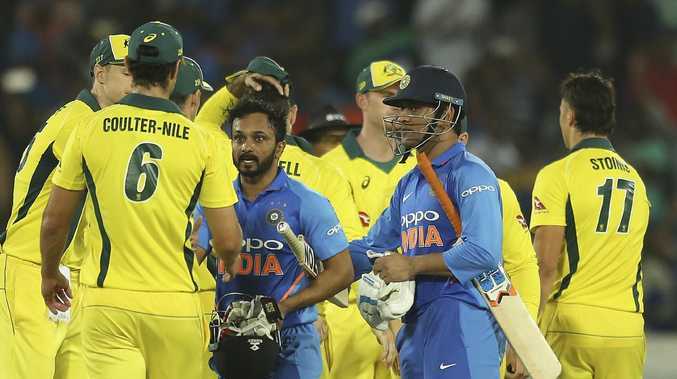 Australian cricketers congratulate India's Mahendra Singh Dhoni, right in blue, and Kedar Jadhav after the Indian team won the first one day international. 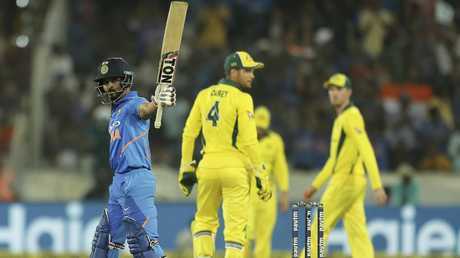 AUSTRALIA have been given yet another lesson in converting starts into match- winning scores by MS Dhoni in Hyderabad, where India prevailed in a low-scoring ODI by six wickets with 10 balls to spare. The result leaves Australia with just four wins from the past 25 ODIs, underlining the perilous state of their World Cup defence, while Aaron Finch is still searching for form after a third-ball duck. But the composure of Dhoni (59 not out) and Kedar Jadhav (81 not out) proved the difference in the five-match series opener, as was the case during the final game in the corresponding series between the sides in January. Australia's attack didn't have enough runs to play with after their reshuffled batting order, in which Glenn Maxwell was promoted to No.5 and scored 40, scrapped together a total of 7-236. "You always feel like we're in the game then a wicket falls at the wrong time," Nathan Coulter-Nile said. "It will click. Hopefully it clicks before the next 20 one-day internationals. Aaron Finch’s poor run continued during Australia’s first ODI against India in Hyderabad. Finch called for a "bit more attention to detail" from the team's batsmen. "If you have a guy go on and get 80-plus it changes the game a little bit... everyone is trying to get those scores," Finch said in the post-match ceremony. Marcus Stoinis and Usman Khawaja staged a steady recovery, steering their side to 1-87 after 20 overs, but it was the top order's only partnership of substance. The removal of Maxwell, who was comprehensively bowled by Shami, reduced the visitors to 6-173 and prompted Alex Carey and Coulter-Nile to adopt a conservative approach as they put on 62 runs during the final 10 overs. "It would have been nice having a set batter going into the last 10," Coulter- Nile said. Dhoni, playing his 527th international match, made it four consecutive half- centuries against Australia in the 50-over format. Jadhav hit out late in the unbeaten 141-run stand. "That was a hell of an innings from both of them. It was a great partnership," Coulter-Nile said.